French Emblems: Emblem: Iusta vindicta. Juste vengeance. Haec secum teneras concinit inter oves. Postremumque Utin viscera nostra ferent. Reddidit. en poenas ut suus auctor habet! 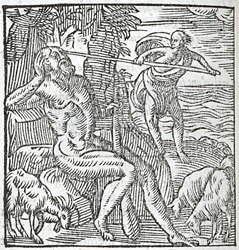 Sitting in the mouth of his arching cave, the Cyclops sang thus to himself amidst his gentle sheep: Do you feed on grass; I shall feed on the Greek companions, and last of all my belly shall get No-man. The man from Ithaca heard this and made the Cyclops eyeless. See how the one who plotted misfortune collects it himself! tur. Historiam hanc petas licet ab Homero Odyssea 9. Par le caut Ulysses, aveugle il l’a rendu. “Ainsi tombe le mal sur celuy qui mal pense. au contraire n’y a celuy qui ne s’en moque. re au 9. de l’Odyssee. 1. A proverbial sentiment: cf. Erasmus, Adagia 3091, Di tibi dent tuam mentem. 2. For the story of Ulysses (the man from Ithaca) in the Cyclops’ cave and his escape by blinding the Cyclops, see Homer, Odyssey 9.177 ff. Ulysses had told the Cyclops his name was No-man. (Utis l. 4).